Below you will find a link to an original Mold-A-Rama operation and service manual. Please feel free to download it and find out what make these cool machines "tick"! Incidentally, the above file is 1.6MB. 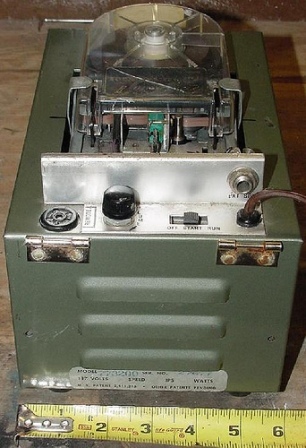 In reading the manual you will see that it refers to a tape player being used during operation; and as noted in the 62 Post article "Eventually, all the machines will be supplied with a double-track sound tape that will periodically explain to passersby what the machine is all about and, when the coin is inserted, add a few space age sound effects." In 2008 I was able to verify their existence and it's seems likely that both style of Mold-A-Rama machines were fitted with this feature. Since originally posting this info it has been brought to my attention that the players were not Cousino Audio Announcers as seen in the photo to the right. They do use the echomatic cartridges and both are similar looking to the Cousino player but they are from different manufactures. Photo's may be a possibility in the future... we'll have to wait and see. 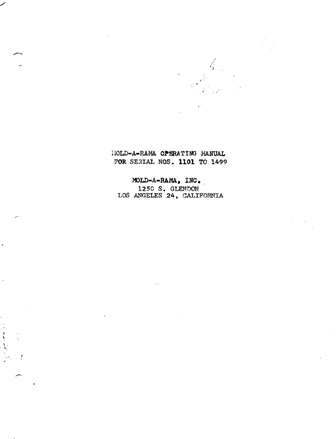 An interesting item noted on the operating manual cover refers to serial numbers 1101 to 1499. That's implying at least 398 machines were produced as type "A" machines, yet there were also type "B" machines. As of yet no one has be able to produce records that verify how many machine were actually produced in the 60's, but among the remaining operating families it seems to be a common belief that less then 500 were made. A better guess is considered in the range of 300. 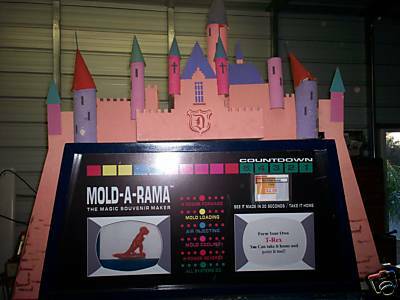 The following is believed to be the first revision of Mold-A-Rama produced, possibly also known as "Type A". As can been seen in the photo, there's a motor to the left which drives a shaft that spans top of the machine. It's right above where your souvenir is made, in and under the display dome. It is pretty much the same type of cam drive found in most older electromechanical coin-op machines of the past, except for the COOL part! The "cam set" on the left actually operates hydraulic switches/keys that protrude from the underside of the machine up to the surface where the souvenir is made! The cams to the right are controlling the electrical side of the machine such as your countdown lamps as well as other electrically run items. Again, this is all taking place right above where your souvenir is being made, and in plane view to watch operate! "The more complicated the better! ", as I always say (kinda like my website, I just wish it were as interesting.) To get another on perspective on the placement of this version please see the photo on the main page of this site. Below is a photo of what is believed to be the second revision or "Type B". On this machine the exposed cam as well as the hydraulic switches/keys have been removed and the whole assembly now placed inside of the machine. Again in this machine there are now no mechanically operated hydraulic switches directly controlling valves from a cam, just more electrical ones doing all of the controlling. Plus on this machine the countdown has been taken off the backglass and put in place of the former cam. I've written down somewhere what the actual wording was on each glass "slide" and post it as soon as I find it of course. You can possible see still see the two styles of machines in action side by side if you make a trip to the Brookfield Zoo in Chicago, they have a type A and type B right next to each other. One produces a Panther and the other a Polar Bear as seen below. Thanks again go to Paul Jones for providing this really cool tidbit of information! 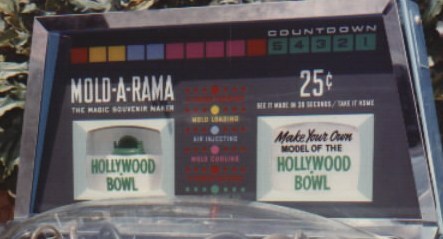 The next few Mold-A-Rama ephemera items were really neat additions. Special thanks again to Paul Jones for being able to share them! When Mold-A-Rama first started out, it is my understanding the you were entering into an agreement with ARA/Mold-A-Rama and were to play the part of a local route operator and not sole owner of the equipment. As such, bookkeeping was a must to satisfy all interested parties due their cut. My question is regarding the "paint sales" line??? 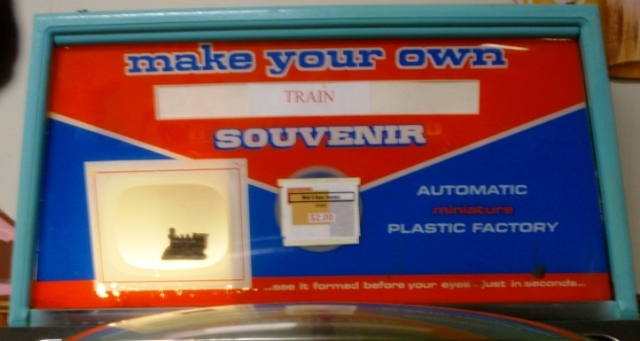 This out of order sign is my favorite Mold-A-Rama item!!! 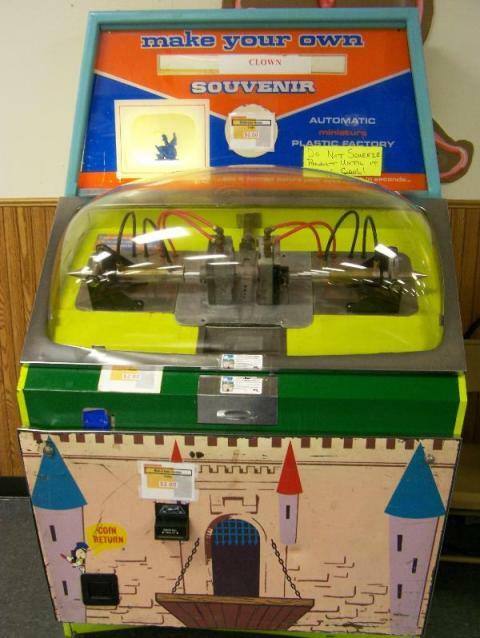 Over the years there have been a number of backglasses produced for the Mold-A-Rama machine. The few found below I believe are originals as released by the Mold-A-Rama Company back in the 1960's. More then likely the first style on the type A machines were as seen below. They feature the countdown timer across the top as well as the status indicator lights down the center. After switching to the type B believe the following two styles were the originals releases on the B machines. Thanks to Jim Irwin we have a photo of a another Original but very rare backglass issued by Mold-A-Rama. It was a Disney version for the machines that produced the Disney characters. 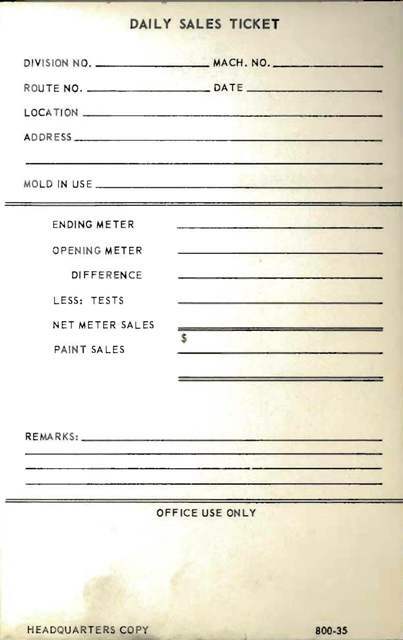 Could the statement "and you can color them too" be related the paint sales line on the Daily sales ticket? And if the weren't enough there was a top for the machine as well! This photo came from a eBay auction of timsattictoys. 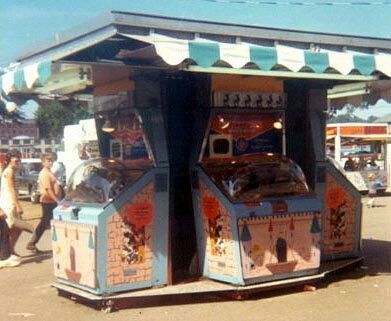 Although to date there is no supporting evidence there were ever any Disney machines in Disneyland they were apparently at the worlds fair in 1964 too. The following photo and a whole discussion on them can be found at http://www.worldsfaircommunity.org/index.php?showtopic=5480 In fact they've discussed them a number of times because of the Sinclair Dinoland Mold-A-Rama's. Give their site search a try!